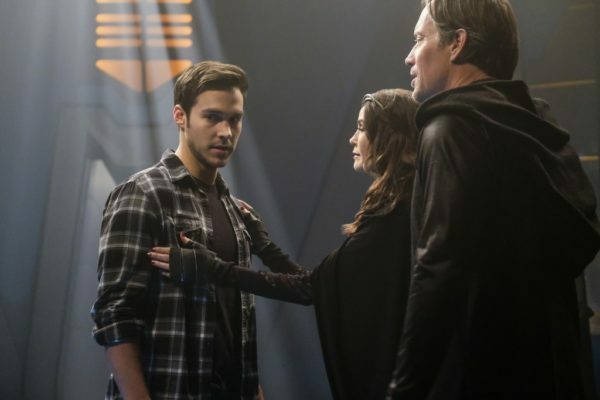 This week, Supergirl sends us Teri Hatcher and Kevin Sorbo as Mon-El’s parents, sends me into a fit of confused rage over Mon-El’s morality, and makes me realize that the key to me liking Winn is to just give him a girlfriend. I don’t even really have to like the girlfriend; he’s just less annoying when he’s in a relationship. Also, Mon-El and Kara break up and we get a few seconds’ worth of introduction to this week’s magical musical crossover with The Flash at the end of everything. We all knew that Mon-El was the Daxam prince, right? I’m pretty sure we all knew that. So it’s no real surprise when the Daxamite King and Queen show up and reveal that, yep, Mon-El is the Daxam prince. At least, it’s not a surprise to us — it’s definitely a surprise to Kara, since Mon-El outright lied to her and never made any attempt (no matter what he says in the episode) to tell her the truth. Not since he met her, became friends with her, or started dating her. Whoops! Kara is, understandably, quite upset by this news. As in most cases, the B-plot of the episode feeds into the A-plot’s morals or lessons: this time, the whole theme is about secrets and lies (jeez, when is it not with these shows?) and forgiveness. All because Winn’s new alien girlfriend is actually an art thief and, it seems, was just using Winn to get him to open up National City’s museum and steal the most famous Van Gogh painting from inside. Hey, uh, who allowed them to keep freaking “Starry Night” in a National City museum? That city is a hub for alien spacecraft crashes, monster battles, mass hypnotism, and general destruction — there is no way that any precious work of art should be allowed within a thirty-mile radius of National City. Anyway, it turns out that Lyra — Winn’s girlfriend — was just stealing the painting because he brother is being held hostage by an alien... art smuggling ring? Alien gang? Whatever. She’s actually good, even though she genuinely is an art thief, and she does care about Winn. Winn, in a bit of a twist on the whole “comic book shows and secrets” plot, uses half-truths and secrets to take down the smuggling ring, rescue Lyra and Lyra’s brother, and save the day. Then he and Lyra vaguely talk about still liking each other, and I assume they’re still together. 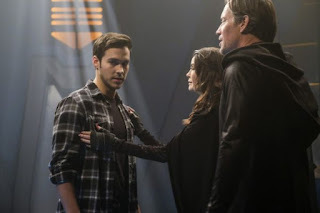 When she witnesses the amicable parting of Lyra and Winn, Kara questions his ability to forgive her for lying and the show tries to equate what Lyra did (lying to save someone she loves from a terrible fate) to what Mon-El did (lying because the truth is inconvenient for him and what he wants out of his life on Earth). Haha, nope. Nope, nope, nope. Trying to draw direct parallels to completely unrelated situations doesn’t work when your audience isn’t stupid, Supergirl. Blessedly, Kara doesn’t fall for this false-parallel technique and actually breaks up with Mon-El. I mean, I’m sad that she’s sad and I wish she’d broken up with him because he’s unbelievably selfish and a cute smile should not blind someone like Kara as much as his cute smile evidently has… but I’ll take it. Lie breakups are just old hat on these shows. A “finally seeing the light” break-up would be a nice change. “Star-crossed” (as in “star-crossed lovers,” a la Romeo and Juliet) is usually defined as people or plans that are thwarted by bad luck or outside forces, but I’m pretty sure the episode is just named this for the space references (aliens!) and because Van Gogh’s “Starry Night” acts as a plot device for the B-plot involving Winn. Because there’s nothing that’s really thwarted by bad luck or outside forces in this episode: the plan involving Winn actually goes swimmingly, and he gets back together with his girlfriend in the end (probably?) — the storyline involving Mon-El and Kara, while definitely thwarted, is thwarted by Mon-El’s inability to tell the truth and be a decent person. Not by bad luck or outside forces. Look, I’m just as sick of dedicating huge chunks of my review to Mon-El as I’m sure you all are sick of reading them, but no other character on this show has inspired such bafflement from me. I genuinely don’t know what this show wants me to think about Mon-El. On the surface, it seems like they want him to be a hero — a selfish prince on the path to redemption, making the right steps in the right direction, but... no? Definitely not? In this episode, they really hammer home how awful Daxam is and how the people are suffering, not just because Krypton exploded and took a huge chunk of Daxam with it (I guess?) but also because the royal family has a history of being terrible and is still currently terrible. Logically, this would be Mon-El’s shining moment of heroism: the music would swell, he would give a great speech and bid Kara a teary good-bye. He would sacrifice the happy, care-free life he established on Earth with the woman he loves for the exhausting duty of building Daxam back up, better than before and more fair to its non-royal citizens. It would be the culmination of all Mon-El had learned while on Earth, a fitting turnabout on his persistent selfishness and a satisfying, if abrupt, resolution of his character arc. Except that doesn’t happen. Not even a little bit. Oh, sure, we get the music and the rousing speech about doing the right thing and Mon-El tells off his parents — but he tells them to go back to Daxam without him, because being around Kara makes him feel good about himself and he doesn’t want to be the prince anymore. He’s sick of being spoiled and royal and it apparently doesn’t occur to him that being royal puts him in a place of power and he could apply his newfound empathy to making his home planet a better place. Mon-El just basically tells his parents to go back to what they were doing before but, you know, don’t let him know all that negative Daxam stuff’s happening because, ugh, guilt or whatever. Because he is. He definitely, definitely is. More so than he has been in the past, because before it’s always just been Kara’s feelings and the occasional crowd of civilians that were victims of his selfishness. Now, it’s a whole freaking planet of people on the line and he’s giving that a hard pass just to chill on Earth some more as... what? He’s not a hero and he’s barely a part of the DEO team. Supergirl has all the bases covered; Mon-El is superfluous and probably more likely to get in the way than he is to actually help, but on Daxam he actually could have made a difference. He probably could have gotten his parents to listen to his reasoning behind not acting like the Daxam currency is Jell-O shots and space heroin. The difference Mon-El could have made would have been a political difference, rather than a fun, face-punch-the-aliens difference, yes — and Kara would not have been there to be all impressed by him, of course. But that’s kind of the point, isn’t it? Doing good for the sake of doing good, and not because it wins him points with the ladies? Saving a planet’s worth of people from freaking slavery. Which is legal on Daxam. And Mon-El’s parents have no intention of stopping. But he could stop it! And won’t! Okay, well, I guess Mon-El is going to be on Earth for the foreseeable future. Don’t know what he’ll be doing or why he’s sticking around but I’m clinging to some faith in the writers of this show that he’ll be a worthwhile, decent character before the season is through. Secondary confusion for this episode: I was under the impression that Daxam had been destroyed, or at least left a lifeless husk, but it’s actually okay and ready to be rebuilt! Just, you know, not rebuilt by the one member of the royal family who grew some empathy. Yet another Hamilton mention on the show in this episode! Also, on Supergirl’s Earth, the king is played by an alien. I really loved the Maggie/Alex/Winn interactions during this episode. Especially Maggie vs. Winn. Winn is terrified of the Sanvers power couple. James got to do something in this episode! ... But he wasn’t great at it.